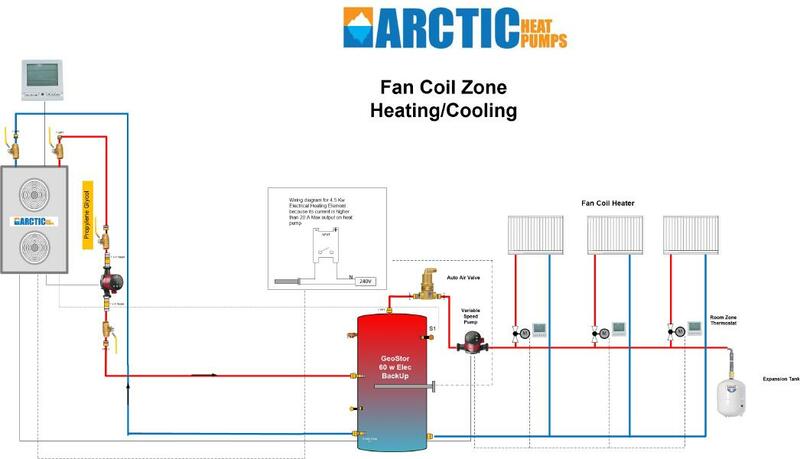 The Arctic Heat Pump is a revolution in heat pump technology that remains unsurpassed in terms of cost and performance. Our Engineers designed this heat pump with a mission to make it the most efficient cold climate heat pump on the market at a price point of ½ of a traditional geothermal heat pump. This was done without any sacrifices to quality. Industry leading parts were mandated in the design of this unit. This includes German Wilo Pumps, Mitsubishi EVI DC inverter compressor, European Sanhua Valves, and Chico digital control system. All this is harnessed directly into complete weather proof housing. 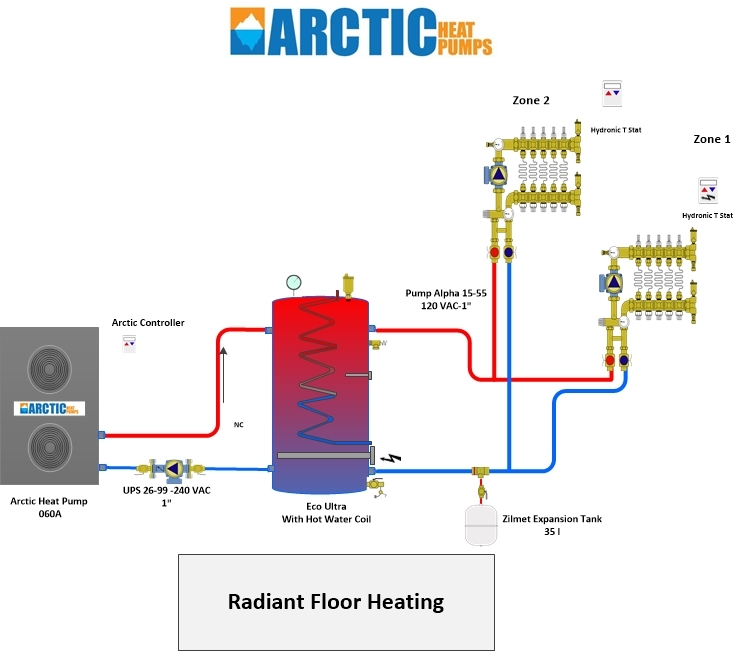 Unlike any other cold climate heat pump system on the market, our Arctic Heat Pump can control your entire home heating and cooling needs including domestic hot water. The heat pump integrates with multiple heating sources such as; radiant floor heating/cooling, central air handlers for forced air, split fan coils for individual room heating, low temperature radiators, and can also integrate to any pool or hot tub to provide full heat with our titanium heat exchangers. The Out Door Unit (ODR) contains everything you need in one case (monobolic). This results in no need to hire a refrigeration mechanic. All you will require is an electrical connection with an outdoor rated disconnect (weather proof). The system requires 240 VAC connection with a 20, 30, 40 Amp dedicated breaker depending on the size of the Arctic Heat Pump. The backup heating circuit in the buffer tank can be automatically controlled from the heat pump itself, making integration with an internal heater simple and effective. The backup heater will be given the signal from the cold weather heat pump only when the heat pump cannot keep up. This ensures you are never wasting energy with two heat sources competing. A standard electric hot water tank can be used or you can purchase water tanks designed specifically for our cold weather heat pumps than include added features such as extra insulation and internal ports for the temperature probe for more accurate temp readings. Rather than split our production into 5 or 6 sizes, our technology allows us to combine heat pumps together to form larger heating systems as required. With the use of our MX controller you can add up to 5 Heat pumps. Our pumping technology also works the same. If your system is too large for the pump capacity, you can simply add a second pump in series to double your flow pressure. 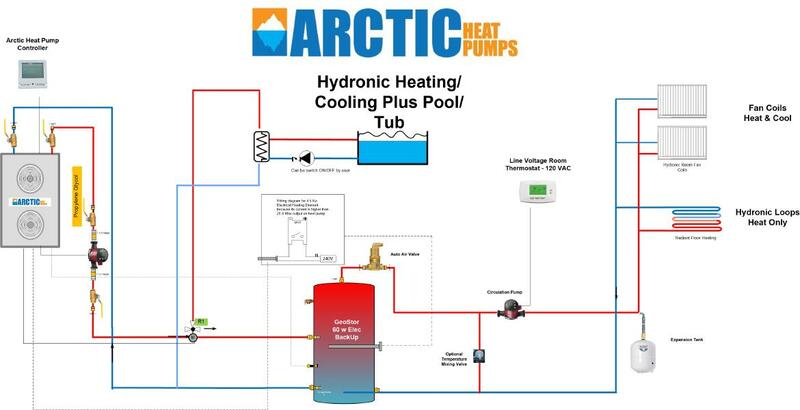 Unlike other cold weather heat pumps that require direct communication to each zone, Arctic Heat Pumps use simple differential controller logic with a tank thermometer probe included. Our tanks have a special cooper probe port insert both at top and bottom so we can accurately measure the tank. The heat pump will automatically be optimized to reach the design temperature set for the tank. As the weather changes, the heat pump will change as well using only exactly what it needs to keep the buffer tank at the set temperature. A brief example will show you how our heat pump for cold climates works. Our factory controller system can manage two zones, and unlimited zones with addition of the MX controller. If we have set up Heating and Cooling, then the heat pump will control both the circulation pump and a 3 way zone valve. Using the tank temperature sensors and an air temperature sensor built into the controller, the pump will turn on and default to the priority zone (either buffer tank for heating or the air temperature sensor for cooling) until it reaches the set temperature. As an example if cooling is priority then the system will cool the room to the set point temperature then the 3-way valve will divert to the buffer heating zone tank and the heat pump will switch to heating to fill its energy needs of the buffer tank which provides heat to zones like domestic hot water, space heating and pool/hot tubs. If the cooling zone requires cooling again the 3 way valve will switch to the cooling zones and the heat pump will reverse its self and provide cooling. Basic Design using Buffer Tank (recommended with back up heating element). Note the Arctic Heat Pump will signal when the element is needed to avoid competing heat sources. The Arctic Heat Pump controls the primary pump and the Heat/Cooling selection as well it will control the 3 way valve. All the other zones such as the heating loops and multiple cooling zones require individual zone controllers or can be centrally controlled by the RESol MX controller. 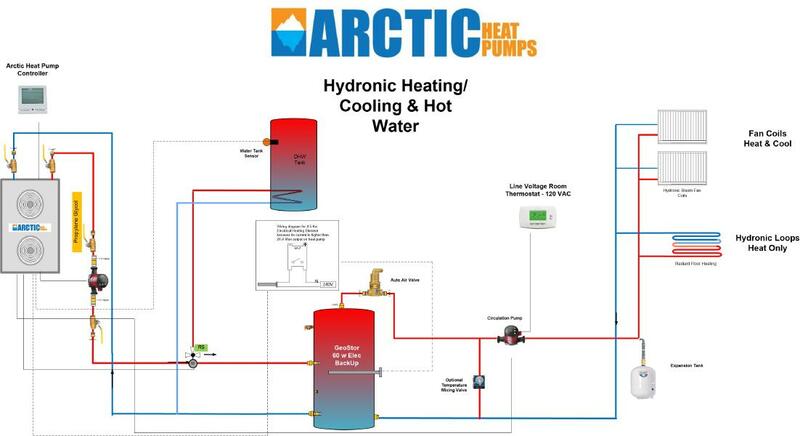 Domestic Hot Water & Heating Cooling – by adding a second zone valve the Arctic Heat Pump is able to heat both domestic hot water and a buffer tank. In the summer this mode can be set to heat domestic hot water and cool the buffer tank to provide zone cooling. Note: Hydronic heating can also be used for cooling by using our MX controller which does radiant floor cooling. This is done by monitoring the dew point and mixing the water so that condensation does not occur. Fan Coil Heating/Cooling is easily done through the use of the buffer tank. The heating/cooling zone is controlled separately by individual room thermostats found on the fan coils. A centralized controller connects to the zone pump. When any of the room zones call for heat or cooling they will close their contact and activate the pump. Each fan coil has an internal 3-way valve so that only the fan coils that have a heat or cool demand will allow the flow. Changing the heat pump for heat to cool will determine whether the buffer tank stores hot water or cold water. Pool or Hot Tub & Heating/Cooling – by adding a second zone valve the Arctic Heat Pump is able to heat both a pool or spa and a buffer tank. In the summer this mode can be set to heat pool/tub and cool the buffer tank to provide zone cooling. Note Hydronic heating cannot be used for cooling so you would require fan coils for summer cooling, a seasonal valve would isolate the radiant floor heat as we don’t use in floor heat for cooling.